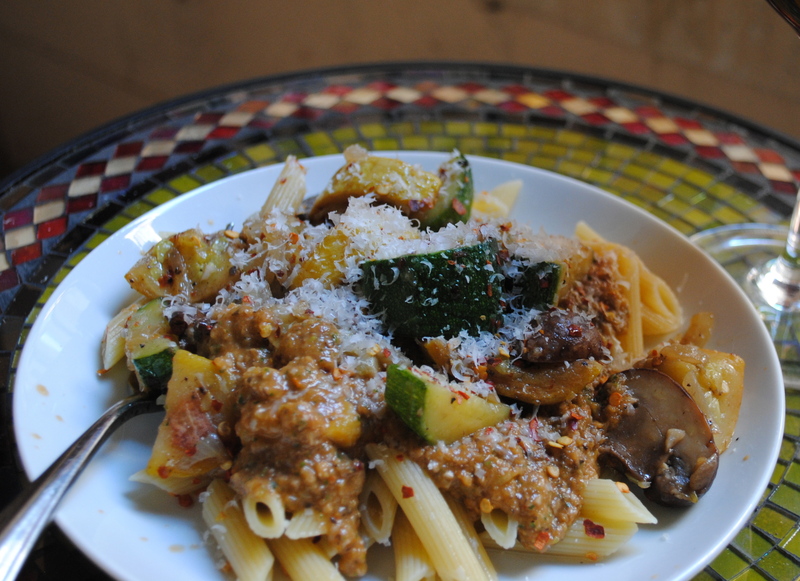 It’s another Food Matters Project recipe! This weeks host is Sarah from Simply Whole Kitchen. 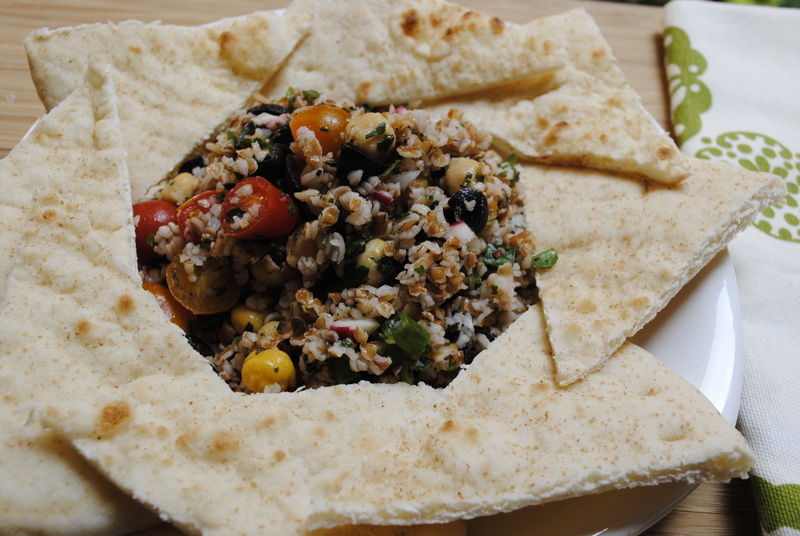 From the Food Matter Cookbook, she chose Mark Bittman’s recipe for Quinoa Tabbouleh. Check out Sarah’s version, and what everyone else had made! Mark Bittman suggests a different version of tabbouleh, which is usually made out of bulgur, tomatoes, parsley, mint, onion, garlic, olive oil, lemon juice and salt. He recommends making this dish with quinoa, and adds more veggies. We didn’t have an quinoa in our pantry, so we used bulgur. Cook bulgur per package instructions. Once it’s cooked, add to a big bowl. Next, add all of the other vegetables, salt, pepper and red pepper flakes. Stir all of the ingredients together. Finally, in a small bowl whisk together the olive oil and lemon juice. Pour over the salad, stir well. Serve with warmed pita bread. So I’ve actually noticed the recipe for this sandwich over a year ago, but haven’t had a chance to make it. I like tuna, but not very frequently. But when a craving hits me, I have to have it now. The original recipe is titled Pan Bagnat. Which is a French sandwich, made out of white bread, which has raw vegetables, hard boiled eggs, anchovies, and tuna. And the recipe, which I found here playing off of the Pan Bagnat, instructs you to put the whole sandwich together to be eaten the next day. Although it’s a great idea to think about tomorrow’s lunch, I wanted the tuna today. So a little spin, and some additional veggies had to be added! This is very filling, so a great light dinner (and fast to make) or a bigger lunch. In a large bowl, toss together: garlic, tuna, Kalamata olives, black olives, red bell pepper, yellow bell pepper, red onion, parsley, artichoke hearts and basil. Stir well so all of the ingredients are combined. In a small bowl whisk together: lemon juice, olive oil and pepper flakes. Once combined, pour over the tuna and vegetable mixture. Add the salt and pepper, and then stir to combine all of the ingredients. 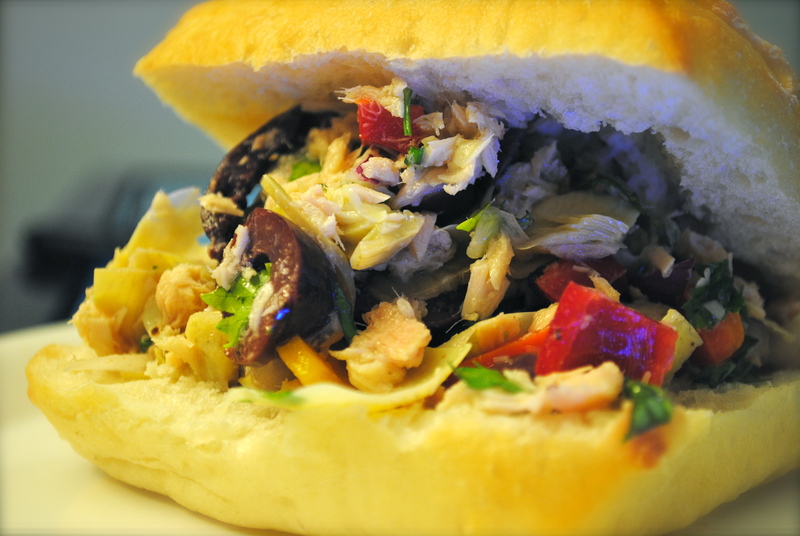 Finally, add the tuna and veggie mixture into each ciabatta bun.